Cleo goes into hiding after a mysterious death at Yasiro Academy, and she and her friends set out to uncover the spy who must be working within the school's ranks. Meanwhile, Xaius Octavian continues his assault on the galaxy as his complicated origin story, and how he went from being Cleo's best friend to a ruthless dictator, is revealed. In the end, a space battle and dramatic confrontation between Cleo and Octavian will change both of their lives forever. 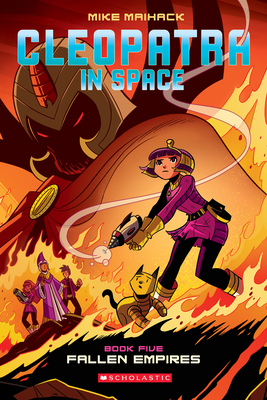 Mike Maihack is the creator of the Cleopatra in Space series. Book One: Target Practice won a Florida Book Award and was a YALSA Quick Pick for Reluctant Young Adult Readers. He is also the creator of the popular webcomic Cow & Buffalo and has contributed to books like Sensation Comics Featuring Wonder Woman; Parable; Jim Henson's The Storyteller; Cow Boy; Geeks, Girls, and Secret Identities; and Comic Book Tattoo. Mike lives with his wife, two sons, and Siamese cat in Lutz, Florida. Visit him online at mikemaihack.com and follow him on Twitter at @mikemaihack.